Spotflux was founded in 2011 by two friends, Dean Mekkawy and Chris Naegelin. It started as a small startup company with a couple of servers in NY. However, they managed to boost their network tremendously: they have reached their 100,000 customers mark in their first two months. Thanks to the help of angel investors from New Atlantic Ventures, Kima Ventures, and Great Oaks Venture Capital, in March 2012, Spotflux raised $1,000,000 for network development. Successful fundraising and wise marketing strategy resulted to an exponential growth of both servers / IP addresses pool and the number of customers in next two years. Spotflux was rated CNET’s Top-10 Security product in 2013. 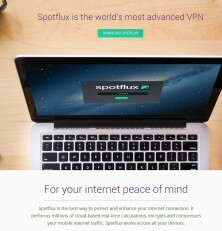 The most important marketing “feature” of Spotflux is their Spotflux Free VPN, a free version of Spotflux, which works as good as the Premium Spotflux VPN. It is “ad supported”, so you will see a small banner at the bottom of your screen. Don’t worry, you will be able to close this banner whenever you want. It looks more reasonably, especially if you compare it with the free version of Hotspot Shield VPN from AnchorFree, where commercials are much more intrusive. Microsoft Windows: Windows XP, Windows 7, Windows Vista, Windows 8 and Windows 8.1. Please note that Windows RT is not supported yet. Mac OS: OS X 10.0 – 10.9 only. iOS: it runs on iPhones and iPads, however it does not work with iOS installed on AppleTV devices. Android: it runs on Android 4.0+ family only. Supported Devices Spotflux works across all kinds of Windows and Mac laptops and desktops, iPhones and iPads, and Android mobile devices. You should not expect it to work on Apple TV, Google TV, and Chromecast devices. Nor can it be installed on your Wi-Fi router to allow all of your devices to use VPN. This is because Spotflux works as a client software only. 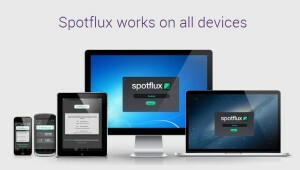 On the plus side, Spotflux allows up to five devices to be used simultaneously per one account. Free Trail Spotflux has one of the most attractive trial versions in the industry. 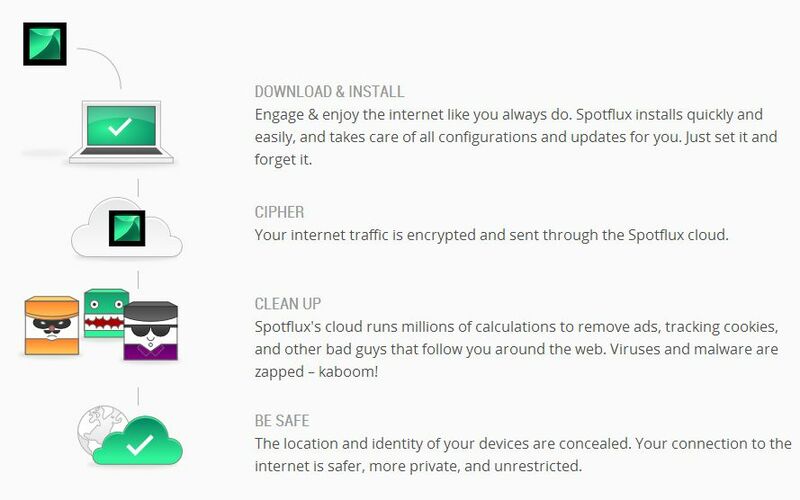 Spotflux Free VPN has all the crucial Premium version features: it hides your real IP and secures web browsing data; it also has unlimited bandwidth and does not cap your internet connection speed. (However, our tests show that Spotflux Free VPN is a bit slower than the Premium version.) The free trial does not have the following features: it does not suspend ads across the web, compress your data, or check your downloads for viruses and other malware. In the case of any issues, you will have to wait 1-3 days, unless your support ticket is answered, because Spotflux Premium members have priority on this. You will pay $29.95 per annum for Spotflux Premium, which is comparable to the closest competitor, Hotspot Shield. As an option, you can choose the $2.99 monthly plan, which is 33 percent cheaper than the appropriate offer of Hotspot. Should you use mobile devices only, there is a special version of Spotflux. You can use it on up to five of your devices – such as iPhone, iPad, iPod, and Android devices – for as low as $5.99 per year! It is an unbeatable price at the moment when this review was written. There are two only payment methods available: PayPal and credit card. Unfortunately, Spotflux has no official refund policy stated on their website. However, you may dispute your payment made through PayPal within 60 days, in case of any unresolved issues from Spotflux’s side. Unfortunately, Spotflux has no official data on the extent of its pool of IP addresses. However, we were constantly getting new IP addresses each day we tested Spotflux. Presumably, they have extensive servers pool, since not one of Spotflux IP addresses was detected as “Anonymous Proxy” by geo-restricted Websites. Unfortunately, you cannot select the IP address assigned to you. There is no option in the Spotflux client software to change the country of IP address; the only country available is the USA. However, it’s reported that Spotflux has plans to change that situation for the better. There is no bandwidth limitation, even for Spotflux Free VPN users. The Spotflux UI is quite friendly. It has minimum configuration settings; however, you don’t need any, taking into consideration the fact that you cannot change anything. An IP address is automatically assigned, and the servers are located in the USA only. Stability tests showed that there were 7 sporadic disconnections during 24h sessions of Spotflux Premium VPN on our three servers located in London (UK), Toronto (Canada), and Wellington (NZ). In accordance with our rules, every 10 disconnections subtract one point; therefore, Spotflux gets 5 out of 5 for connection stability. We have approximated the connection speed results from our three servers and found that Spotflux Free VPN has download connection speed average of 18 Mbps, while the Premium version connects at 45 Mbps. The download speed for all of the connections was higher than 16 Mbps; it’s 5 out of 5. Spotflux is a USA-based company. Therefore, it falls under the jurisdiction of USA PATRIOT Act. Expect your personal data to be disclosed if an appropriate court asks Spotflux to do so. On the other hand, Spotflux gathers minimum information during the sign up process; they will have your email, IP address, and credit card details only. In order to test Spotflux Customer Support, we have created three support tickets from three different Premium accounts. All of them were answered within 5 hours. Unfortunately, Spotflux has no phone number to call their support team; therefore, the score is 4 out of 5 for Spotflux customer support.